Editor’s note: this year, I am featuring a different poet from the anthology each month. For February, Alison Stone shares some of her experiences with Tarot-inspired painting, poetry, and community. Without further ado, I turn the blog over to her. I was introduced to the tarot in childhood, when a friend gave me a “tarot game” for my ninth or tenth birthday. Manufactured by one of the leading toy companies, it came in a bright purple box and contained a tarot deck, some poker chips, and instructions for both playing the game and using the cards for divination. I was fascinated with the images and the idea that these cards could tell the future. Abandoning the game after a couple half-hearted attempts, I turned my energy to memorizing the cards’ meanings and their placement in the Celtic cross. The cards were Rider-Waite outlines, but colored differently, (tan instead of yellow, for example), probably to save money on printing. I felt that these strange drawings held secrets and was excited for them to be revealed. Though I usually found memorization quite easy, especially if the subject interested me, I simply could not learn the cards’ meanings. Spacey and dull, I had no idea what they were trying to say. It was as if someone or something was telling me “no.” I put the cards away. In my late teens, I bought several other decks and loved seeing the different ways artists interpreted each card. I also bought a variety of books on the tarot and began to study. Again, something odd happened. While I easily digested the material about tarot history and the overall meanings of the cards, when I tried to learn their divinatory messages or how the cards affected each other in a spread, I once more got the clear feeling that this was not for me. One day I decided to paint my own interpretation of The Star, a card I felt particularly drawn to. When I finished, I started The Tower. At this point I made the decision to paint the 22 Major Arcana. It took me ten years to complete the 78 paintings. Sometimes I got bored and wanted to quit. Other times my connection to the cards was scary, as when I set to work on the Nine of Swords, in a perfectly sunny mood, to suddenly find tears streaming down my face. I had the paintings produced as a deck, overseeing the process to make sure the colors, which were of primary importance to me, came through. Surely now, I thought, using the cards I had made, I would be capable of divination. Disappointingly, the answer was again “no.” While I could recite the meanings of each card, my attempts at divination were clumsy and forced. 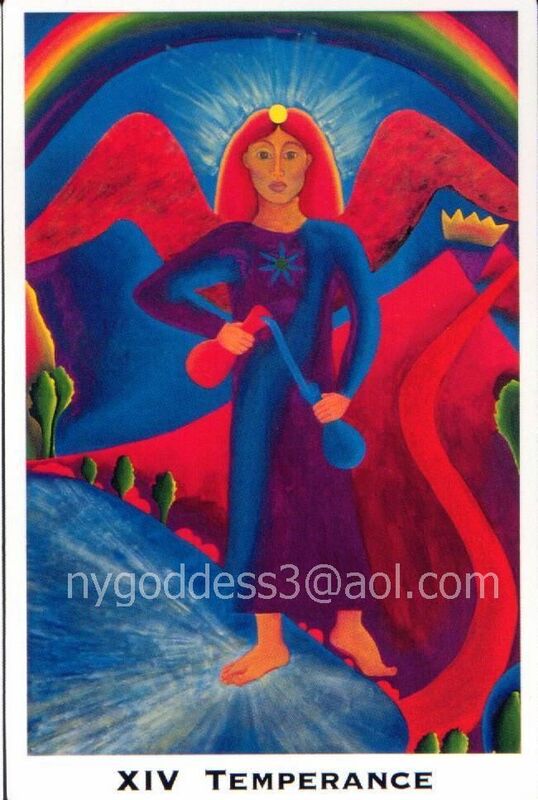 On the other hand, the tarot healing work I was developing deepened and strengthened. 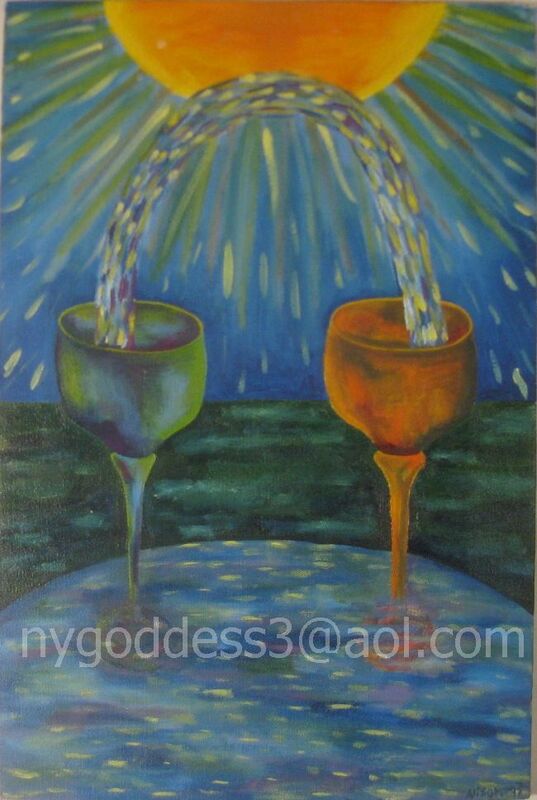 Maybe, I thought, I had done what I needed to do with the tarot artistically and could move on to other projects. I didn’t believe that for long. During the painting of the deck, a line had come to me — “this earth you drag your feet upon is paradise.” I wrote it down with the title The Empress but didn’t write from the tarot again until I had finished all the paintings. Then more lines revealed themselves and it became clear – my next task was tarot poetry. My first encounter with the tarot in poetry was during freshman year of college, when I read Eliot’s The Wasteland in a literature survey class. I had read little poetry, and had no interest in reading more, but this poem amazed me. Though I didn’t understand it, I was drawn into its mystery and music. 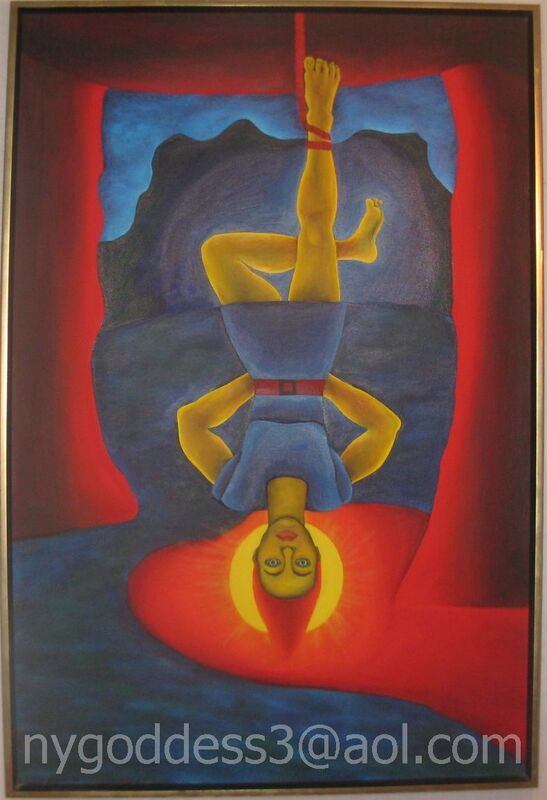 The reference to the Hanged Man was one of my few anchors in trying to understand the text. I felt a grateful flash of recognition, like hearing English spoken while traveling abroad. By the time I turned to writing my own tarot poems, I had been writing seriously for years and had my first book published. I read voraciously. While I rarely encountered the tarot in poems, the few instances when I did were unexpected delights. I finished the 22 poems of the Major Arcana, got them published as a chapbook, and once more wondered if I was done. I wanted to write about other things. Tarot, however, had other ideas. Again it was clear that I needed to do all 78. As with the paintings, the process was sometimes organic and inspired; other times an exercise in determination and will. 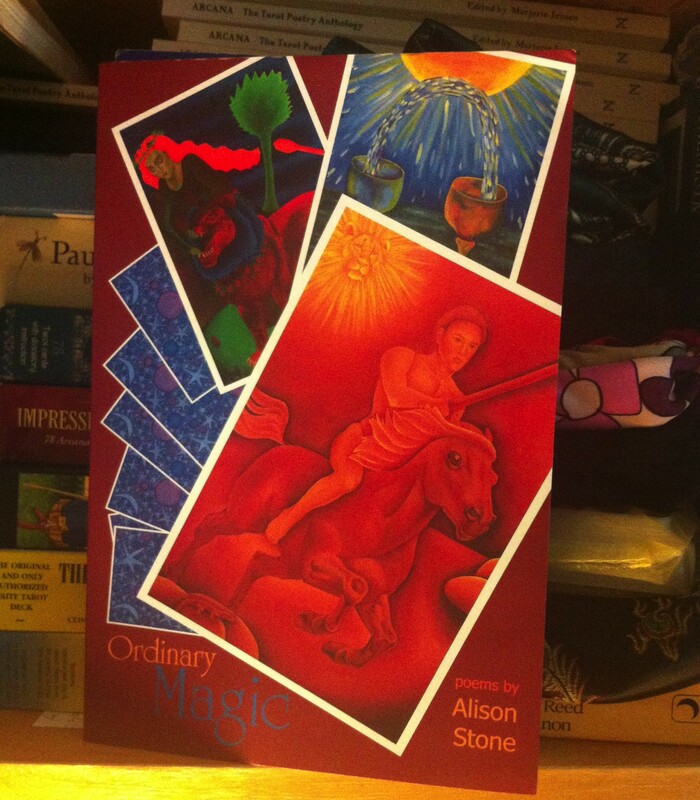 That book, Ordinary Magic, is complete, but my stewardship to the tarot is not. I’m not sure where I’ll be led next. I’m pretty sure there’s a nonfiction book in my future, describing the tarot healing work I’ve been practicing with some of my therapy clients. This work has been evolving for years, but now doesn’t feel like the right time to write it down. I think the next step in my tarot/poetry journey involves community. Thanks to the internet, tarot enthusiasts and poets are able to connect with unprecedented ease. The tarot poetry anthology brings a bunch of us together to let our words percolate and deepen their individual impact (thanks, Marjorie). It’s like Tarot is throwing a party and people from all over the world are coming together to celebrate and dance. I’m delighted to be on the guest list. for me; I am an angel. above my head like a giant umbrella. I understand you are only human. by recycled heart hungers or the lust beast. in the cold school of the sea. 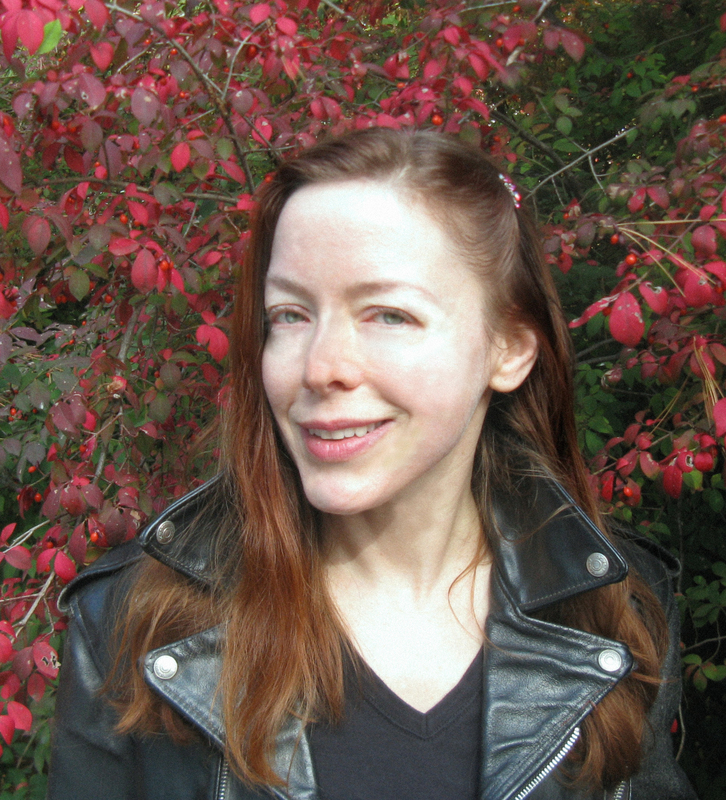 Also, check out Alison’s bio and information about the other poets who will be in the anthology here. This entry was posted in Blog and tagged Alison Stone, featured poet, Stone Tarot on February 1, 2015 by tarotpoetry.